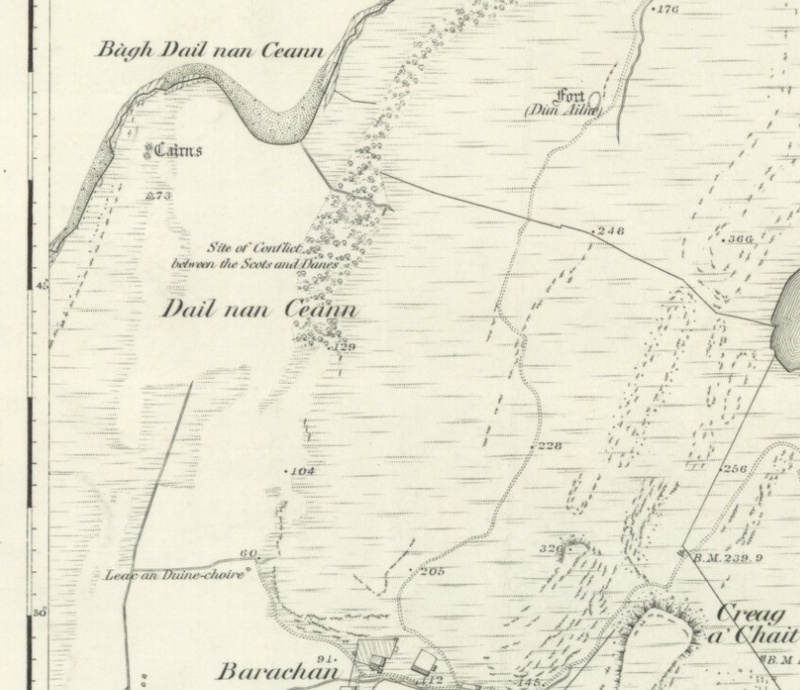 Bàgh Dail nan Ceann – ‘the Bay of the Field of the Heads’. This place-name has been fascinating me for ages. How could you read that, and not want to go there? In May we tried to find it by walking south down the coast, but were stopped by a fairly impenetrable birch and hazel wood on a rocky headland. Yesterday we got the maps out again and approached it from a different direction, starting on the east coast and walking roughly west then north, with considerably more success. As for a date, the Viking presence in Scotland would suggest something like the 9th or 10th century – but we can only speculate. The place-name paints a vivid enough picture in itself. The afternoon was warm but not oppressive, with a cool breeze blowing in off the sea. After weeks of hot sunshine the lane was white with dust – not a sight you see very often in western Scotland. Despite some recent drizzly rain, the ground was still tinder dry. Leaves of ash and sycamore were charred brown and curling at the edges, and patches of bracken were turning yellow, giving the illusion of autumn. The track skirted a patch of woodland, crossed a couple of cattle grids and opened out into moorland, where a sparkling blue lochan was dotted with gulls. Around a bend between some low hills the land fell away gently to the west, giving a magnificent panorama of sea and islands. We walked down through a gate guarded by rowan trees, past a lovely farmhouse and into a sheep field. As the sheep eyed us curiously, we scanned the field for a particular feature we’d read about: Leac an Duine Choir, ‘the tombstone of the just man’. In a landscape where boulders lie scattered in every field, this was harder to find than you might expect. We discovered it, however – a long recumbent stone partly concealed by clumps of reeds. We looked for inscriptions, and found them: a small carved cross and what looks like two capital Bs, one reversed. What they represent is anybody’s guess. (Another small cross is apparently carved above the Bs, but I could not make it out). Tracing the lines with my finger, I wondered about the ‘just man’. Was he a hermit? A missionary-saint, to whom people came for advice? What was his name? And was he around when Viking ships stole like grim spectres into the bay? A local story tells how this stone was once taken away and used as a lintel for the farmhouse, but a strange voice was heard every night thereafter, insisting that the stone be returned to its original place. Eventually, the builders were forced to comply. A couple of hundred yards away the closely-cropped sheep field gave way to a deep expanse of reddish-brown reeds mixed with buttercups and flag irises. Here and there, white tufts of cotton grass fluttered. The Field of the Heads. Underfoot, in normal conditions, it would have been very boggy indeed. We pushed our way through the needle-sharp reeds, squelching occasionally into mud. Colin, who had been hoping for at least one skull, expressed disappointment. When we emerged onto the rocky beach, however, I glanced twice at the blood-red jellyfish that were floating in the shallows, bigger than dinner plates, their tentacles flaring out in the water like unkempt hair. The sand on this beach was grey and coarse, sprinkled with a few limpets and slaty pebbles, and pungent with seaweed. On the black basalt boulders, shattered crab shells lay bleaching in the sun, the relics of a seagull feast. A single rowan tree was growing in a rocky outcrop, and I clambered over a fence to sit in its shade. The tide was coming in with a steady rhythm of waves washing and breaking, washing and breaking. How many tides since that remembered battle? Was it on a day like this, with a warm salty wind and sunlight glinting like steel on the water? Is it all still happening, but we just can’t see it? As Colin went looking for orchids, I gazed around at the peaceful bay. To the south-west, a low ridge where the remains of the burial cairns may lie hidden in the waist-high bracken; to the east, a steep cliff densely covered with birch and oak, their branches swaying with a dry rustle in the wind. No cuckoos now – only stonechats on fenceposts, tutting at our presence. Back across the field, past the stone of the just man, through a kissing gate and into the delicious shade of the trees. Words carry so much more than their literal meaning. You imagine who has spoken them, who has heard them, human links in an invisible chain of memory. If one end of that chain lies with the warriors in the Field of the Heads, and the other end lies with us, can we join them up? I want to ask the just man, who must have been wise. Meanwhile the landscape is waiting for the first drop of rain to fall from a cloudless sky. This was a lovely post…a haunting history of a lovely place. Thank you. Thank you, and I’m glad you enjoyed it. Fascinating story and gorgeous beautiful photos. I miss Scotland. A vividly evocative piece of writing. Thank you for taking me with you to a place I probably shall never get to in real life. ‘Is it all still happening, but we just can’t see it?’ Yes, I know exactly what you mean, and have sometimes wondered the same. Thank you, and you’re most welcome! It’s so lovely to revisit the place by writing about it. I’m glad you ponder the same question! Hard to even put words to it, but you can almost feel the answer. THe scenery is splendid, and so are the images that emanate from your narrative. Thank you! Yes, such a beautiful landscape, so many memories! Beautiful photos Jo, and plenty of food for thought. You’re in a lovely part of the country, the peacefulness is blissful in your pictures. Thank you, Lorna! The peace is so deep here. We’ve just come back from standing on the jetty, just listening to the waves gently lapping. We had rain today and there’s such a fresh smell everywhere. the spring before my thirteenth birthday. as it has been all my life, is white, pure white. I guess it’s what I expected you to find in the field of the heads. When I looked up “bog cotton poem” I found many poets had written of it, but this one was the one stuck in my head. Thanks for shaking it loose! How lovely, Edith! Thank you for sharing that. “Thinning elders among the heather” – I’ll remember that! Lovely description, and it reminds me of my own dad with his lovely white hair. What wonderful photos and text.You had me pretty well walking along side of you.Thankyou. That’s so kind, Robert, and really nice to know – thank you! I love discovering little places like this with such an amazing hidden history. Jo, what an absolutely lovely and lyrical post. I enjoyed it immensely. I felt just as though I was walking alongside you in the dust and sun and birdcalls. Thank you so much, Jenny! That’s a lovely comment. It’s wonderful to be able to share these places.